Do you ever get a foggy feeling when you hear mention of “the cloud”? 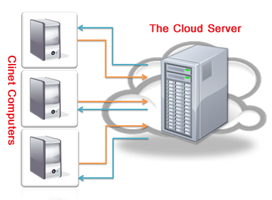 We often hear about cloud computing, cloud services, cloud this and that, but what is the cloud? The concept behind this term and all other variations of it is not new. The cloud refers to services provided to you by computers (other than your personal computer) via an internet connection. These services could be something as simple as an email service account, a backup service account or an application service account. At the other end of the cloud, there is usually a high powered computer which provides a service or services to you via your personal computer. And that is all there is to the cloud. How convenient is that cloud service? This involves looking at the convenience provided by the service itself, the availability of tech support when you need it and the effect of internet speed related issues to the cloud service. Is your information going to be secure? Whenever you use a service in the cloud such as a data backup service you want to make sure your information is going to be secure before passing it along. Hackers often try to get off with a bigger payoff. So a cloud service with poor security can be a pot of gold for hackers. If a cloud service provider cannot offer any security guarantee or accountability for your information against hackers, it’s best to keep your sensitive information off the cloud. Is it cheaper to buy the application/program or use it in the cloud? There is no sense in buying a program only to use it once. But if that program or application is the mainstay of your routine computing needs, cost is a factor to consider. It will be beneficial to your wallet if you assess the cost involved in both options. Is there more or less maintenance for the end users? One of the benefits of using a cloud service is having less maintenance on the end users part. In the corporate world, the cloud makes it possible to have a central point from which applications can be deployed and managed. That can translate to savings for large businesses. For home users, less maintenance could mean having a cloud service that automatically backs up your computer to the cloud. A home user may not experience savings to the same degree as a business. But the peace of mind that comes from a reliable cloud service, without further sweat from the user, can be reward enough. Cloud services are not for everybody, but they can be a great solution when the situation is right. Cloud services are becoming a popular trend. Do your own research to establish the pros and cons of any cloud service before jumping on the cloud bandwagon. It’s always better to be safe than sorry. Hope the above guidelines can help you filter through the cloud and find the right cloud or non-cloud solution for your backup, application or computing needs.